I finally got around to upgrading to new cell phone and plan. Sprint, Samsung M520, SERO plan — nothing fancy. The phone isn’t even quite as awful as I had been expecting. But, as suspected, adding on a Phone-As-Modem (PAM) data plan (to enable internet access from my laptop and N810) was a nightmare. In fact, because — well, I’ll spare you 40 minutes of various excuses from customer service — it ends up being “impossible” to add. So even though my phone supports it, and I’m grudgingly willing to fork over an extra $40/month ($960 for the term of my contract), Sprint’s billing system won’t take my money. Wooooonderful. I suppose I could look at other cellular providers… But I have little faith that I’ll find better results elsewhere, or be able to do so without a week-long migraine. Perhaps AT&T and the rumored second-coming of the Jesus Phone will provide salvation. I still have concerns about Ma Bell’s less-than-immaculate hands, but this feels more and more like a strategy game… Jump there, hope the rest of the industry moves, and then jump somewhere else. Oh well. At least for all my troubles I’ll have a slightly better cell phone with a nifty ringer for the next two years. 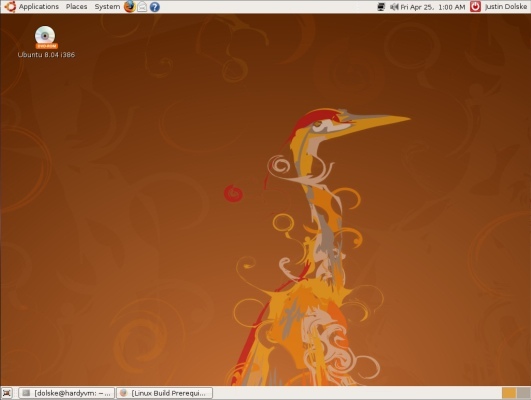 Ubuntu 8.04 “Hardy Heron” came out today (*checks clock* err, yesterday) — congrads to the Ubuntu community on the release! I just finished installing it under VMWare Fusion on my MacBook, and will upgrade my home and work Ubuntu desktops this weekend. Installation was painless. I didn’t even need to edit xorg.conf and specify my monitor’s horizontal refresh rate! 🙂 Video, sound, and networking all worked. I must grumble a little bit, though, that the installer still can’t automagically detect the keyboard type, and instead presents a list with a zillion obscure variants (with a default selected). Maybe it’s just not possible… I remember how installers of yore used to do the same thing for mice (“Serial mouse? Bus Mouse? PS/2 protocol, or Logitech?”, etc. ), but that all seems to Just Work now. Selecting my physical location is also slightly annoying; it might be neat to do a GeoIP lookup to guess… Anyway, both just small nitpicks. P.S. Love the Heron artwork!